As the potential for social media marketing becomes harder for business owners to ignore, more and more are turning to the internet to get the answers to the questions that have kept them from starting social media marketing sooner. To aid those who have yet to start social media marketing while looking for answers to lingering questions, here are four answers to common social media marketing questions. What Are the Aims of Social Media Marketing? Like all forms of marketing, the goals of a social media marketing campaign can be numerous and vary from business to business. Depending on the industry, the demographics of their current clients, and habits of their target audiences, organizations can social media with different aims in mind. For all organizations, one goal of social media marketing is increased public awareness about their brand. As was noted in a previous article on this blog, more than three quarters of online adults have social media accounts. Social media marketing is a free way (though one can pay for better exposure) to position a brand on platforms that are used by hundreds of millions of people. Social media marketing also has a positive effect on SEO efforts, so it helps boost public awareness in other ways as well. As the term suggests, social media marketing can also be used to market and advertise an organization’s services to their target audiences. Again, the ways that businesses can use social media for this goal varies by their target audiences. Certain demographics are more likely to use social media than others, and certain industries are easier to market on social than others. Regardless, a business’s target audience is on social media (unless the target audience is “people who don’t use social media”), so it’s worth the effort to find ways to use social media marketing. A final goal of social media marketing is to foster closer relationships with customers. This doesn’t mean that corporations and consumers are going to become BFFs. Rather, businesses can strengthen the connection that brought the customer to them. For example, patients go to doctors because they trust the doctor for health advice and diagnosis, using social media to answer patient questions or give out useful health information reinforces that relationship (i.e. connection). Similarly, if price is the most important concern to a business’s client, social media channels can be used to announce specials and give fan-only discounts. Whatever kind of relationship a business has with consumers, one aim of social media is to strengthen that connection. One of the challenges of social media marketing is that there are so many networks available, business owners have trouble deciding which channel is best for them. It’s not enough to simply look for a social network with a lot of subscribers. There are now more than a dozen social virtual communities online with more than 100 million members; it be neither cost efficient or effective to attempt to use every social media platform. Marketers need to research each platform to make a good choice. Because of it’s high adoption rate among online users of all demographics, Facebook is always a good choice for starting social media marketing. However, other networks appeal to more specific demographics. For example, a maker of denture cream would be a little foolish to spend a lot of effort trying to market their product on Instagram, since Instagram is primarily used by young adults. As was discussed in a previous post on this blog, business owners should also consider niche social media sites that are geared toward their industry or target demographics. Even if these networks have significantly fewer members than the more popular networks, the fact that they are geared towards an organization’s interests means the marketing efforts will be that much more effective. 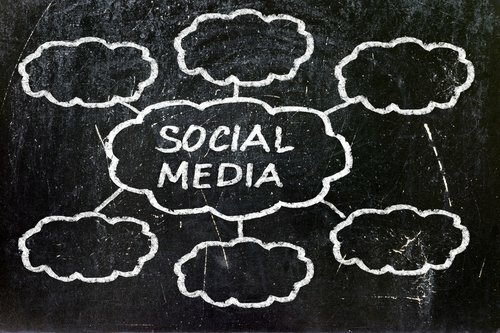 Can Social Media Be Used For B2B Marketing? A common misconception about social media marketing, is that it can’t be used for business to business marketing. This isn’t true, but it is understandable that people would make that assumption since companies aren’t known for being particularly social in the ways that drive social media. The first thing to remember when correcting this misconception is that while organization aren’t social, the people who own them and run them are. In this way, business to business marketing on social media can work just as well as business to consumer marketing on social media, though it takes a little more effort. The most important thing about B2B marketing on social media is finding the proper platform for reaching the businesses an organization wishes to market to. For example, a company marketing to businesses that offer professional services, LinkedIn is the best place to let other entrepreneurs and business owners know about the organization’s products and services. And just like cute cat photos on Facebook, valuable business information spreads on LinkedIn because that it the mindset of the people who use the platform. On the other hand, an organization trying to market to restaurants would be wise to use Facebook, since most restaurants have an actively monitored Facebook account for their customers so the B2B marketing message has a better chance of being forwarded up the chain if the offer is enticing enough. By marketing on the proper platforms and producing engaging, enticing offers, social media can be used for B2B marketing. How Should I Handle Negative Comments? A key concern for beginning social media marketers is negative comments. Recent research has confirmed that people tend to be ruder online than in person, and business owners will eventually face some of the ire from unhappy customers. But this shouldn’t discourage business owner from using social media marketing because negative comments are relatively simple to handle. Handling negative comments on social media is similar to handling them in face-to-face situations. The main goal of the business is to satisfy the customer because repeat business and a good reputation are the cornerstones of any successful enterprise. In this way, negative comments on social media give businesses one more chance to make things right with customer they wouldn’t have had otherwise if the customer had simply walked out the door angry and never looked back. The fact that social media is extremely public is a double-edged sword for handling negative comments. While the rantings of a disgruntled customer makes the customer look bad, it doesn’t reflect well on the business either, especially if negative comments are ignored. The best thing to do when a negative comment is left on a public board on social media (like the Timeline on Facebook), respond to the customer’s complaint by giving them a way to talk in private. This shows people that the organization cares about customer satisfaction while preventing a long and possibly unflattering conversation to play out in the full view of all the fans. Even though it’s been around for a while, social media marketing is still new and challenging to a lot of business owners, the good thing is that answers to most questions do exist. If there are any questions you would like to see answered on this blog, send us a message.